Gluten-free Chocolate Cherry Thumbprint Cookies are soft and moist. 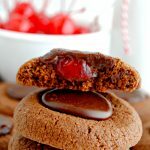 The nestled cherry and the chocolate glaze makes this cookie totally decadent! Perfect for the holidays, parties or as a special treat. In a large bowl stir together gluten-free flour, xanthan gum (leave out if your flour has it already) cocoa, salt, baking soda and baking powder. In a large bowl using a mixer cream butter and sugar until fluffy. Add egg and pure vanilla extract and beat well. Gradually add flour mixture, beating until well blended. Chill dough in the refrigerator for 10-15 minutes. Cut the maraschino cherries in half, unless you want a big cherry flavor then use the whole cherries. Keep the cherry juice for the glaze. Shape dough into 1” balls and place on a parchment lined cookie sheet. I like to use my cookie scoop, it makes the perfect size ball and it's much easier than doing by hand. Using the back of 1/4 teapoon or your thumb, press down the center of each ball to make a cherry sized cavity. Place 1/2 cherry in each cavity. (If you want a big cherry flavor use the whole cherry). Bake for 10 minutes. Cool on wire rack. In a small saucepan, combine the mini chocolate chips and sweetened condensed milk and heat on low until the chocolate is melted. Stir in almond extract and 4 teaspoons of the cherry juice until well blended and keep on a very low heat. Spoon 1/2 teaspoon of chocolate glaze on each cookie, spreading to cover the cherry. Glaze may need to be thinned with additional cherry juice until all cookies are covered.